FrameShots takes snapshots of MPEG/AVI/WMV/DivX and other video files to create high-quality thumbnails. Features include the ability to navigate frame by frame to find the perfect shot. It has an option to auto-trim any black borders around your movies. You can quicky copy the frames to the clipboard to use in any video editing software. It also has a batch mode feature which automatically makes thumbnails at periodic set intervals. FrameShots, Create thumbnails from MPEG/AVI/DIVX/WMV and other video files. ...... Grab screenshots of videos quickly and easily. * Capture an image from any video! Great for grabbing AVI snapshots, MPEG snapshots, and WMV snapshots. Also works with XviD, DivX, Ogm, and any other video file Windows Media Player can play. * Batch Process! Take snapshots at set time intervals in a movie or set desired number of snapshots for a movie and watch FrameShots do the work for you. * Watermarks! Have FrameShots automatically place a text or image watermark on your screenshots. Control the transparency and placement of the watermark within FrameShots. * Command Line! Grab screenshots of video via the command line. * DRM support! FrameShots has the capability to capture screenshots of videos protected by Digital Rights Management (DRM). * Precise Navigation! Use seeking bars and skip bars to move frame bye frame to that perfect video still. Control the skip feature by pre-setting the amount of frames to skip by. Capture pictures from DVD-Video and DVD folder. CaptureIt is a powerful, flexible and easy-to-use screen capture software. Qweas is providing links to FrameShots Video Frame Capture 3.0 as a courtesy, and makes no representations regarding FrameShots Video Frame Capture or any other applications or any information related thereto. 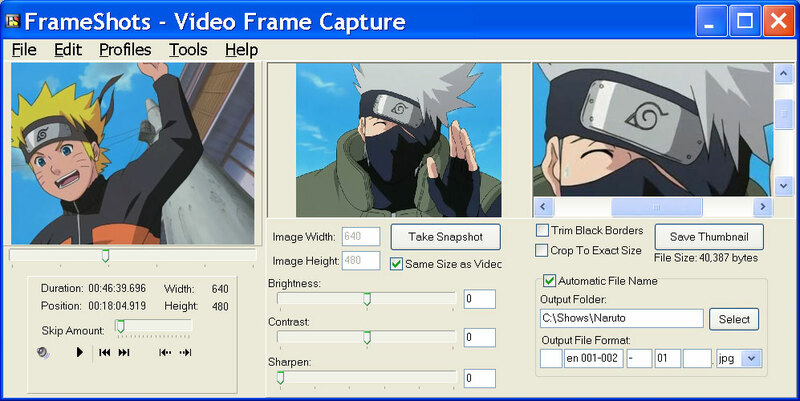 Any questions, complaints or claims regarding this application FrameShots Video Frame Capture 3.0 must be directed to the appropriate software vendor. You may click the publisher link of FrameShots Video Frame Capture on the top of this page to get more details about the vendor.